Almost everybody knows what Rockabilly is and what it represents. It’s a musical hybrid based on two strong music tendencies that attracted each other like magnets. ; hillbilly music mixed with rock and roll, something obviously waiting to happen. The rockabilly fashion and culture might have disappeared from the mainstream media, but is still alive, not only in the United States but also in other parts of the world like Germany, Australia and Japan. Japan Rockabilly or “Greasers” gather every Sunday at the Harajuku and Yoyogi parks. The Harajuku gang derives from an old subculture called “Kaminari Zoku” (Thunder Tribe), a criminal gang. The Kaminari Zoku was more than a subculture. It was a dangerous gang formed back in the ’50s. All the members wore similar clothes as the ones used by their counterparts in the US, and they also followed some of their infamous modus-vivendi, like illegal customised bikes, street racing, authority defiance, and fighting… lots of fighting. That gang died long time ago, but their souls are resting peacefully knowing the new generation of rockabillies is here. 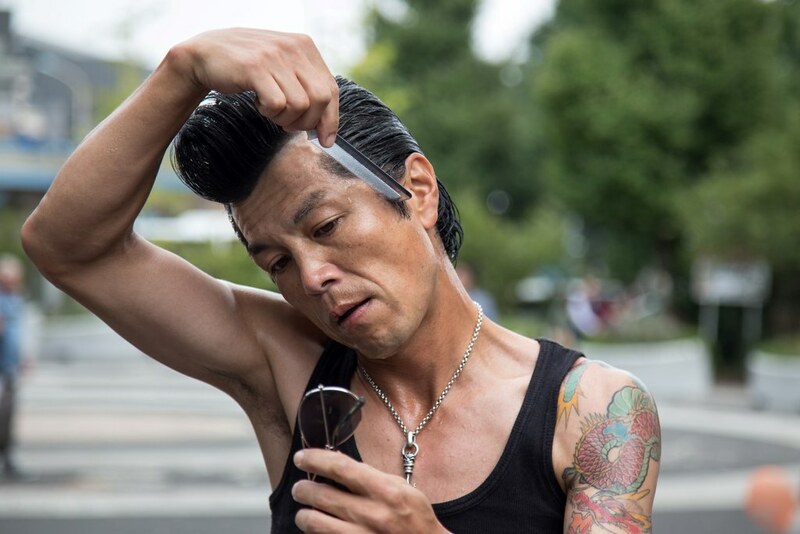 Their descendants reunite each Sunday at Yoyogi Park or Harajuky Park in Tokyo to mingle and dance having forgotten the crime and bad behavior the rockabilly genre was all about. Now is just a way to differentiate themselves from the rest, to have an identity, to enjoy the music and forget reality. Girls wearing ‘50s paddle skirts, awesome tattoos, levi’s 501, combed hair are seen with them as well. Obviously this type of subculture have also its own art and music that can seen and heard across Tokyo, in different venues that attract other rockabilly fans around the area. After displaying rock and roll old moves, listen to some music, mingle with their peers and flirt the the girls, these park riders say goodbye to each other to go and get ready for Monday, like everybody else. It is cool to see how many ways to forget the daily routine exists. All of them deserve a big applause I might add. Some other gang members just chilling. Ladies and guys as well.